When I was growing up there were few young female drivers in the sport of truck and tractor pulling. It was therefore quite challenging to see myself driving a pulling truck one day. However there was one young female driver that competed with my father, and nothing would make me happier than when she had a successful pull. That driver was Lisa Tatum, who still competes in the two wheel drive class and continues to be one of my tractor pulling inspirations. Lisa Tatum was born a puller. 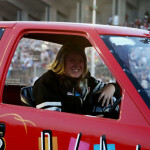 With her father being a competitor, her mother attended truck and tractor pulls right up until the week Lisa was born. She spent her childhood watching her father compete and when her older brother became old enough to drive she cheered him on as well. Tractor pulling was something she loved her whole life and therefore she feels that it was destiny that she would one day drive her own pulling truck. When Lisa was old enough to drive, it was a natural transition from crew member to driver. She began to drive a vehicle that her father purchased called ‘Hot Shot’ and became the third driver of her father’s vehicle ‘Foolish Pleasure’. 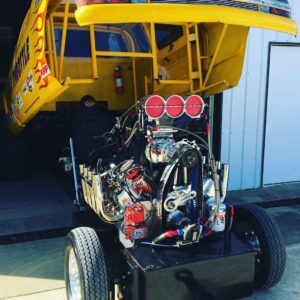 Eventually, Lisa began driving her own vehicle and competing directly against her brother T.J. She now competes in a bright yellow chevy called Full Throttle, which features a 526 Keith Black Hemi with Veney head s and a Mike Janis blower. Her father Tony and brother T.J. do all the assembly on their engines and their parts come from Sassy Racing Engines. Like many other pulling teams, Lisa Tatum and her father compete directly against one another on the track. Her father gave up his driving rights for many years so Lisa could have the opportunity to compete with her brother. When her brother began his family he stepped out of the drivers seat and her father Tony began to drive again. Lisa truly believes that it is a gift to compete with her father. They both want to win but they also want one another to win as well. Living away from her family has made tractor pulling quite difficult for Lisa. She does not get to work on their trucks as much as she would like, but she makes up for that with the pulls. She does everything she can to contribute to the care of their vehicles, but focuses most of her attention as a driver. Lisa believes that best part of truck and tractor pulling is equally the competition and the people. She loves the thrill of tractor pulling but also contributes the love of pulling to many of the people she has met through it. Lisa has found her best friends through truck and tractor pulling, including her fiancé, Tyler Slagh who competes with a mini rod tractor. Lisa Tatum has experienced many successes since she began her driving career in 1997. She was the first two wheel drive points champion as well as the first female in the Professional Pulling League in its inaugural season. 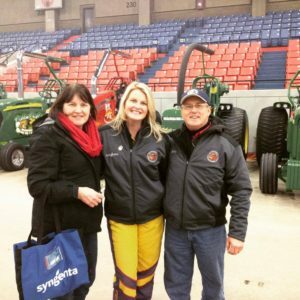 She was also the first female to win the finals at the National Farm Machinery Show. She also won the Jeff McPherson Memorial pull the year after he passed. He was a puller from Ohio and one of Lisa’s favourite trophies is from that event. Being a female has had a big impact on Lisa’s driving career. When she began pulling it was not rare for her to be the only female amongst all the classes at a tractor pull. She did encounter her share of individuals who doubted her abilities but proved that she belonged in the drivers seat, all thanks to her families support. Lisa claims that it was quite intimidating to be the only female, but she used this to her advantage and received a great deal of support due to her gender. Motorsports is definitely a more welcoming atmosphere to women than it was 20 years ago. There are so many women competing all across the board today. Lisa believes that just like any dream every girl should know that they can do anything they put their minds to, but it definitely helps to have a solid foundation like she has from her family. In the future, Lisa hopes to continuing pulling as long as she is able. She w ould love to try out the mini rod class which is the class her fiancé competes in. He and his father campaign three tractors on the Lucas Oil circuit which makes it difficult for them to be at one another events. But as for right now her heart is still in the two wheel drive class! 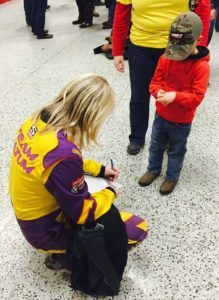 Lisa Tatum is an excellent role model for all women competing in truck and tractor pulling. She has excellent sportsmanship and also enjoys promoting the sport. Recently at the National Tractor Pulling Championships in Bowling Green Ohio Lisa was a representative for the Miles Beyond 300 Road Show, where she interviewed several tractor pulling legends. Good luck with the rest of your season Lisa! Mackenzie is a 23 year old student from Uxbridge, Ontario Canada. 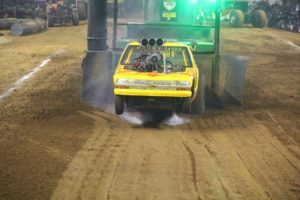 She competes in the sport of truck and tractor pulling with her super modified two wheel drive truck called Child's Play. Mackenzie has grown up in the sport as her dad has been driving for over 30 years. She is passionate about motorsports and loves to see more women getting involved!